What is the difference between PennDOT, PA Turnpike, and Local Municipalities? PennDOT was established in 1970 and oversees transportation issues in the Commonwealth of Pennsylvania. The administrator of PennDOT is the Pennsylvania Secretary of Transportation, currently Leslie Richards. PennDOT supports over 40,000 miles of state roads and highways, about 25,000 bridges, as well as new roadway construction. In addition, other modes of transportation are supervised by PennDOT. These include aviation, freight and passenger rail, mass transit, intrastate highway shipping traffic, and the ports of Philadelphia, Pittsburgh, and Erie. PennDOT also oversees motor vehicle safety & licensing, and driver licensing. It administers the state's more than 11 million vehicle registrations and 8.8 million driver's licenses, and oversees safety and emission inspection programs. To learn more about Driver & Vehicle Services visit www.dmv.pa.gov. Among some other sources, PennDOT is supported by the motor vehicle fuels tax which supports functions related to highway and bridge work. Though there is occasionally the opposite misconception, revenues in the Motor License Fund cannot be used on transit. The Pennsylvania Turnpike officially entered service in 1940. It is a toll highway operated by the Pennsylvania Turnpike Commission. A controlled-access highway, it runs for 360 miles across the state. The turnpike begins at the Ohio state line in Lawrence County, where the road continues west into Ohio as the Ohio Turnpike. It ends at the New Jersey border at the Delaware River–Turnpike Toll Bridge over the Delaware River in Bucks County, where it continues east as the Pearl Harbor Memorial Extension of the New Jersey Turnpike. The Pennsylvania Turnpike uses the ticket system of tolling. When entering the turnpike, motorists receive a ticket listing the toll for each exit; the ticket is surrendered when exiting, and the applicable toll is paid. If the ticket is lost, motorists are charged the maximum toll for that exit. Cash, credit cards, and E-ZPass are accepted at traditional toll plazas. The PA Turnpike is supported by the system of tolling. Local municipalities administer localized services in Pennsylvania. There are six types of local governments listed in the Pennsylvania Constitution: county, township, borough, town, city, and school district. All of Pennsylvania is included in one of the state's 67 counties, which are in total subdivided into 2,561 municipalities. Municipal authorities are set up to perform special services. Projects include public facilities such as buildings, including school buildings, transportation facilities, marketing and shopping facilities, highways, parkways, airports, parking places, waterworks, sewage treatment plants, playgrounds, hospitals, and industrial development projects. More than 78,000 of Pennsylvania’s 120,000 total roadway miles are owned by municipalities. They’re also responsible for roughly 6,400 bridges. How does PennDOT, PA Turnpike, and Local Municipalities work together? PennDOT is a government entity and sets the policies and procedures for Pennsylvania transportation. Both PennDOT and the PA Turnpike promote work zone and driving safety initiatives. PennDOT and municipalities collaborate exhaustively through project planning, investments, and federal and state requirements. PennDOT Secretary Leslie S. Richards also announced earlier this year that the department’s project planning process has been updated to include local communities earlier in the project process so community needs are identified earlier and included where feasible. For more PA Turnpike information, visit www.paturnpike.com. For more PennDOT information, visit www.penndot.gov. 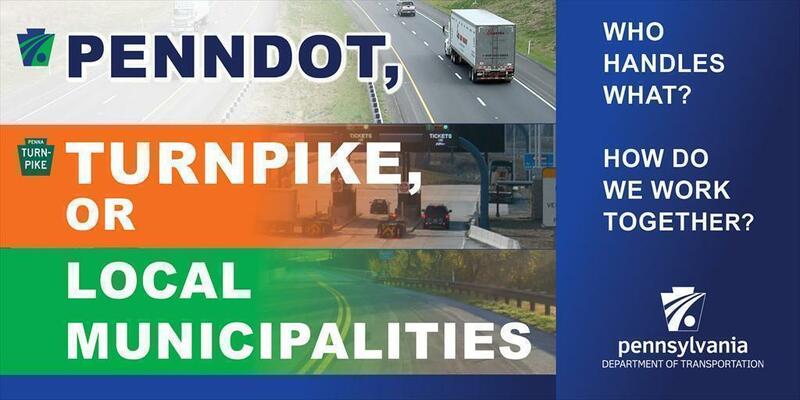 Follow PennDOT on Facebook, Twitter, and Instagram.